No Jameis Winston. No problem. 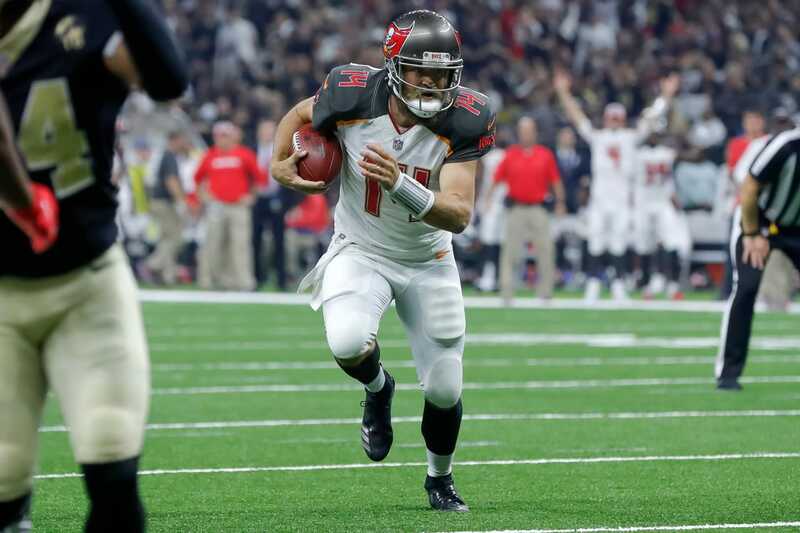 Quarterback Ryan Fitzpatrick stood in for the suspended quarterback and stood out, passing for 417 yards and four touchdowns while running for another score in the Bucs 48-40 win over the Saints Sunday. Fitzpatrick did something Winston struggled doing a year ago. He connected on passes of 58- and 36 yards to DeSean Jackson for TDs and 50 yards to Mike Evans for another score. Jackson was injured after catching a pass in the fourth quarter and had to he helped off the field. He finished with five catches for 146 yards and two TDs. The Bucs scored on their first five possessions and added a defensive touchdown in the first half. Cornerback Vernon Hargreaves forced a fumble by Saints running back Mike Gillislee and safety Justin Evans scooped it up and raced 34 yards for a touchdown to give the Bucs a 31-17 lead. The Bucs didn't need punter Bryan Anger until 7:42 remaining in the third quarter. It was a shocking start to the season for the Bucs, who have to rely on their 14th year veteran for at least three games until Winston returns. Turns out, they may not have to rush him back. Fitzpatrick showed he still has some Fitzmagic left. The Saints pulled to within 48-40 but were out of timeouts when Fitzpatrick ran for a first down on third-and-11 right before the two-minute warning. The Saints took the opening kickoff and drove it for a touchdown with running back Alvin Kamara scoring on a 5-yard run. But Fitzpatrick showed immediately that the Saints were in for a fight. With Jackson lining up in the slot, the Saints somehow lost coverage on him and Fitzpatrick lofted a perfect 58-yard bomb to Jackson, who only had three touchdowns last season. The Bucs defense did not do much to slow Brees. They sacked him once, but they forced two fumbles. But the story was Fitzpatrick, who went 2-1 as a starter last season when Winston injured his shoulder. All he did was produce the best opening day performance by a Bucs quarterback since Steve DeBerg passed for five touchdowns over the Falcons on opening day in 1987.